If you ever find yourself (as I frequently do) perusing the list of one-word-birds, you may notice that some families of birds are better represented than others. There are no one-word owls, for example, or woodpeckers. You won’t find any gulls or penguins on the list either. What you will find, though, is a disproportionate number of ducks. One member of the duck family – the Mallard – may actually be the most commonly encountered one-word-bird in the entire world. Our familiar green-headed friend is in fine company too, with cousins including the Garganey, the Redhead, the Canvasback, the Smew and the undeniably adorable Bufflehead. But why does this single group of birds merit so many more mononyms than others? The answer, I think, lies in who names birds, and it seems likely to me that different groups of birds have been named by different groups of people. Take, for example, the gulls. These ubiquitous, mostly-identical, oft-maligned birds have never held any importance in the eyes of most people, and as such there has never been a need for the lay person to distinguish one from the other. For this reason most people simply call them all “seagulls” in complete ignorance of the fact that there are dozens of unique species1. The scientific community, then, is free to dream up some typically unimaginative monikers without pressure from the masses. Ducks, on the other hand, do have importance to humans owing mostly to the fact that they are delicious. Their tasty flesh makes people want to hunt them, and hunters have historically created easy, memorable names for the species they shoot. There’s a certain elegant simplicity to names like Redhead and Canvasback, and in the hunter’s vernacular they are complemented by others including Bluebill (for Lesser Scaup), Sprig (for Northern Pintail), Spooney (for Northern Shoveler), Sawbill (for Common Merganser), Skunkhead (for Surf Scoter) and even Greenhead (for our friendly, everyday Mallard). Many of these colloquial names have disappeared over the years, giving way to the biologist’s inclination towards standardization and consistency. Some have persisted though, and many of our extant one-word ducks are colourful and charismatic. All but one, really. And yes, that is the one I am intent on blabbering on about today. It may seem overly humble or humdrum to you, but in my mind it’s practically a runway model: the Gadwall. 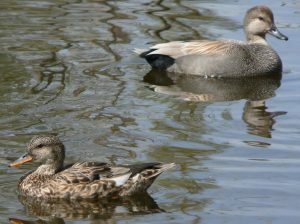 A pair of Gadwall, in all their resplendence. Now I may have dropped the argument at that point (or many points later, who can remember? ), but in the years following I have made it a small mission of mine to ensure that Kevin pays dearly for his cruel and unnecessary slight on this noble bird. Indeed we can scarcely pass within a mile of one without me reminding him of that fateful day and calling his character deeply into question. Even now, probably ten years on, I am thoughtlessly implicating him by name for the world to see3. I don’t even feel bad about it. At this point I probably should admit that I had may never have thought twice about the Gadwall before that day. But injustices of any sort should not go unmet, and it was the callousness of the attack that presented this little duck to me in a new light. If you’ve never been fortunate enough to lay eyes on a Gadwall before, allow me to paint you a picture. 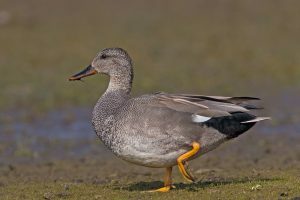 The male Gadwall is an absolute symphony in gray. His head is gray, his back is gray, his sides are gray, his belly is gray, and his tail is also gray. The gray has a faint mottled pattern in which different shades of gray contrast slightly with each other. Oh, and the bill is also gray. The female is brown, but basically all female ducks are brown so we can hardly fault her for that. A male Gadwall strutting his stuff, and rightly so. The discerning observer will note that the male does possess three distinctive colourful field marks. First, the feathers on his hind end are black. Second, there are some white feathers in his wing which are sometimes visible. Thirdly, some of the feathers on his back cross the border from gray into brown territory making for some very lovely, if indeed subtle, contrast. His feet are also yellow, but since they’re almost always underwater, that’s not really important. Now at this point you may be thinking that my interest in the Gadwall is more based in stubbornness than in genuine appreciation, and you may be at least partly correct. But I must not be the only one who enjoys this bird, because it has held on to its special name in a time when many other ducks have not. Making that fact even more surprising is that the name, which has been in use since at least the mid-1600s, doesn’t seem to mean anything. At least not anymore. I like to think that maybe it never did. Maybe it was the result of some ridiculous argument between a couple of duck hunters in the English countryside, with one making disparaging remarks and the other defiantly assigning a unique name in protest. If I have somehow unknowingly carried on a centuries-old tradition of raising hell over trivial, bird-related quarrels, my life would seem just about complete. The next time you’re strolling along the water, taking in the array of reds, blues and greens, remember that not all ducks are created equal. I urge you to take a moment to look beyond the rainbow for the little gray duck in the corner. He may not be bright, bold, or even beautiful, but the Gadwall deserves a little love too. 1Referring to a bird as a “seagull” is a great way to get a free ornithology lecture, as no birder can resist vigorously correcting you on this clearly non-trivial error. 2I’m sorry if you happen to like Coors Light. Mostly I’m sorry that you haven’t discovered beer. 3Well, the ten people that read this. You are a most delightful writer dear Kyle. Love this!